Hi friends! We have had a warm autumn day today. I collected some odd bits and pieces from the garden and sketched them. There are still surprisingly many flowers. Today, I have a Halloween tutorial on the Sizzix blog, for a really fun technique which can be used for any theme. I was happy to see that Sizzix carries a new cool surface, namely Thermoplastic Sheets. The sheet can be die-cut, dry embossed, stamped and colored. Best of all, they are heat-moldable and once cooled, keeps their shape perfectly. I thought they would be a great match with Tim Holtz new Laboratory dies, to form dimensional jars and vials. 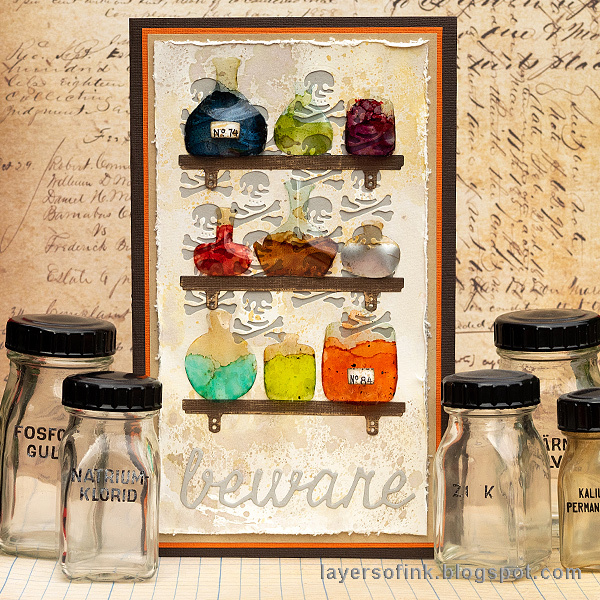 I had such fun making a spooky laboratory with vials of weird stuff on the shelves. This project was originally a card, but my oldest liked it so much, that I turned it into a wall-hanger for his room instead. By simply cutting off the back piece of the card, mounting the laboratory on chipboard, and punching two holes at the top. It was happy to use some old chemistry jars for the photo, which I bought in a second-hand shop a couple of years ago. You can find all the steps and close-ups on the Sizzix blog. Thank you so much for visiting here today!